Eiichi Miyazato (1921–1999) The Final Interview! Leo Lipinski is the highest graded non Japanese in the JKF Gojukai and is a stouch supporter of Shuji Tasaki Shihan. I first met him back in 1989, he is one of the best exponent of kumite I have seen and fought. He has single handedly built up JKF Gojukai in the UK , Europe and South Africa. GS: How long have you been practicing martial arts? How you got started, why, who you trained with ? Leo Lipinski Shihan – I started Martial Arts–judo and some karate in 1962. In those days the training was very poor and the instructors new little more than the students. Shotokan was the first style I was exposed to?it was then the only style available. GS: How many styles have you trained in? Leo Lipinski Shihan – Shitoryu (Shukokai),Shotokan and Goju and of course various methods of Goju. Also, boxing , different methods of Kung-fu and Thai boxing. GS: Have there been many changes in Karate since you started training? place in many Central and Eastern European countries where I teach. Also today Karate has to compete in the marketplace with a multitude of other sports and leisure options. Many years ago our choices were more limited so people stuck more easily to one activity. GS: In your opinion what aspects of training should students be concentrating on to improve there techniques, and why? Leo Lipinski Shihan – this is difficult to answer in simple terms. Firstly it depends on their motivation for practising karate. Some want exercise, some want to study the “art” side of the Martial Arts. I am yet to see this myself. Some are only interested in Kata. Other want self-defence– finally or maybe not finally there are those who enjoy all aspects of fighting. Returning to your question; to achieve excellence at any activity requires a lot of repetitive basic practise. This can be related to all the aspects I mentioned at the start of this answer. It could be fundamentals related to self defence–including Bunkai, it could be drills and strategy practise for kumite, it could be a mixture of typical (I wont say traditional) Kihon practise for Kata and ultimately Kihon kumite. It depends on the way of teaching of a specific instructor. My prime interest in karate is kumite and its application as a self defence methodology. I firmly believe that to learn to fight you must fight. So most of my basics are geared to fighting not the typical up and down movements you will see in most dojos. I use these for warm-up only and usually I dispense with this type of monotonous practise after about 15 minutes. Many teachers today concentrate on Bunkai and prearranged training–I do not spend any time on this yet my students know the application of all movements in their kata. I use kata techniques directly in fighting. Obviously used with safety as many can be dangerous. Most of my classes then are geared towards fighting, yes and Kata, but Kata only being learned for its capacity to be a record of the various techniques to be used in combat. Leo Lipinski Shihan – I will have to think about this one. Perhaps you need to tell me what kind of stories I can tell you. GS: You’ve trained and spent a lot of time in Japan with the Gojukai, are there differences between the Japanese style of training / etiquette / grading etc and what we do over here? Leo Lipinski Shihan – There are many differences in attitude to work, to discipline and to values. I think we are potentially as good as the Japanese but we do not as a rule have their dedication. Another difference is our preoccupation with sport as opposed to Budo. Sport has its place and so does Budo but karate essentially has Bujitsu at its core. We in the West do not have the depth and the quality at the top and we confuse sports results with competence overall. Japanese etiquette is far more noticeable. Westerners are also far more “grade-hungry” than the Japanese and not as likely to realise that grades should be earned and should not be awarded (almost of an honorary nature). GS: Shihan you were graded to 5th Dan by Gogan Yammaguchi and you were the at the top of the IGKA. What was your main reason for the change from the Yammaguchi group to train under Tasaki Shihan (Gojuryu Karate do Seiwakai) ? Leo Lipinski Shihan – many of my reasons were of a personal nature. The main reason initially was I did not like all the people who in later years had joined the Yamaguchi organisation. Also the emphasis in the training had changed and the new ways were not to my liking, these were the primary reasons. GS: In your opinion who are the great fighters of modern times? Leo Lipinski Shihan – What do you mean by great fighters? From which aspect of karate–WKF sport or the contact versions. Certainly in sport names like Otto from Britain and Pinna from France spring to mind. I think Otto has won the world title more than any other. Insofar as the traditional format is concerned–this one is far more difficult to answer. I have very little knowledge of the Kyokushin top fighters and they are a very tough group. There are many groups practising contact within a variety of rule structures. GS: What is your analysis on Sports Karate? 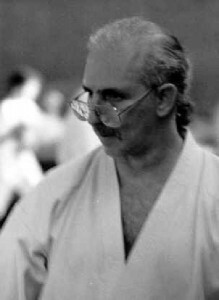 Leo Lipinski Shihan – I do not have an ‘”analysis” as you put it. I have an opinion. Sports or karate with rules is by its nature for young people?how do we defines young? I will leave that to you. Personally I do not train myself with a view to “rules”–rather I train with limited contact using many so-called prohibited techniques–with a limit to the intensity and obviously avoiding some target areas such as joints and eyes. To me contact is great but in training it should not be so hard as to prevent you training daily–of course accidents can happen in all physical activities. GS: How do you see the future of Goju Ryu Karate do Seiwakai Internationally? Leo Lipinski Shihan – We will grow and grow and grow – and with perseverance our standards and level will also go from strength to strength. GS: Is there anything else you’d like to share with us? Leo Lipinski Shihan – yes–I would like to see you and your readers get as much pleasure out of Karate and all that is associated with it as I continue to receive.